These adorable earrings were designed by Felipe Barbosa of San Miguel, Mexico. The earrings measure 7/8 cm wide x 1" high. 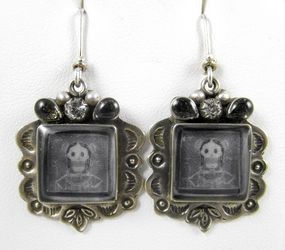 The earrings are comprised of gold & silver tone metal, with a single epoxy section portraying a skeleton Katrina in black & white. Crystal & polished stone accents adorn the top portion of the earrings. In excellent condition, the earrings bears the Felipe Barbosa hallmark on the reverse side. Be sure and check out the matching pendant!